DENVER - An energy company executive's sip of fracking fluid at an industry conference this month has been called a demonstration by some and a stunt by others, but it's bringing attention to new recipes for hydraulic fracturing fluids that in the past have contained chemicals commonly used for antifreeze or bleaching hair. He raised a container of Halliburton's new fracking fluid made from materials sourced from the food industry, then called up a fellow executive to demonstrate how safe it was by drinking it, according to two attendees. "I thought if this stuff was so benign, why wouldn't the CEO drink it himself? That frankly was my first thought," said Environmental Defense Fund's Mark Brownstein, who saw the demonstration. "My second thought, more seriously, is on the one hand, I'm pleased to see Halliburton is taking steps to remove toxic chemicals from hydraulic fracturing fluid. I wonder why if they have this technology why it wouldn't become standard practice. "I also do in some ways think the stunt is very much indicative of the problem the industry has in assuring the public that they are in fact taking public concerns seriously," Brownstein said. "Because quite honestly, a homeowner in Pennsylvania doesn't have the option of having an underling drink his water. He has to do it himself." 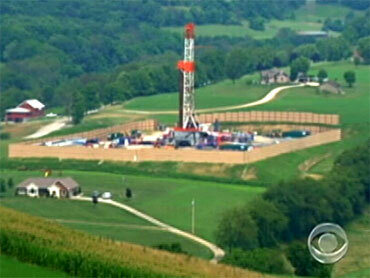 Roughly 90 percent of wells in the U.S. are fracked, according to the Colorado Oil and Gas Conservation Commission. Companies have resisted disclosing exact recipes for fracking fluid for competitive reasons, and those who voluntarily post disclosures on a public online registry called FracFocus can exclude some chemicals. Halliburton's website lists CleanStim's ingredients as enzyme, exthoxylated sugar-based fatty acid ester, inorganic and organic acids, inorganic salt, maltodextrin, organic ester, partially hydrogenated vegetable oil, polysaccharide polymer and sulfonated alcohol. Brownstein said using ingredients from the food industry won't necessarily make a fracking fluid safe for drinking water. "Salt is a food-grade ingredient, but if you have too much salt in your well water, your well water is not usable," Brownstein said. Still Carlson said it was a good sign that Halliburton and others have introduced fracking fluids that they say are safer for the environment for reasons such as using biodegradable ingredients or allowing for less water use.